One of the London Skyline’s most recognisable buildings. 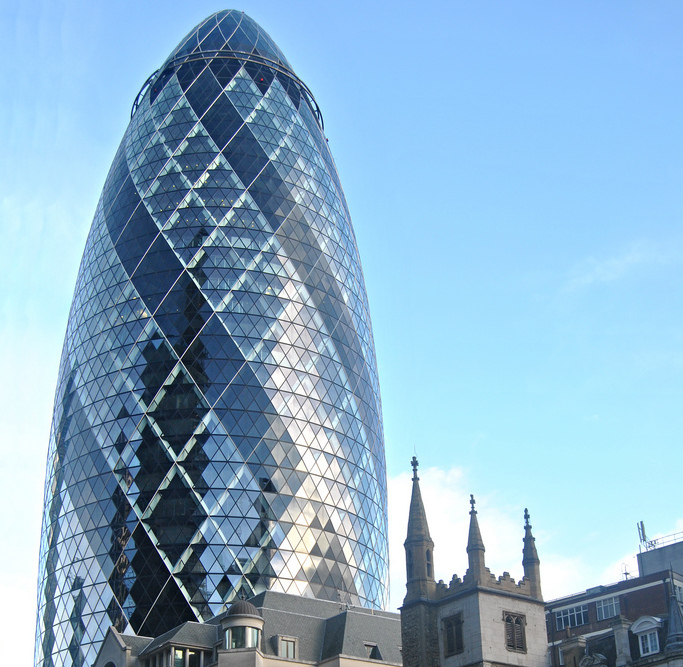 The Gherkin (also known as ‘30 St Mary Axe’, and previously as the ‘Swiss Re Building’) is located in London’s primary financial district. In addition to this, the commercial skyscraper stands at 591 ft (180 metres) tall, and houses 41 floors. Eventually, after a long planning process, the elegant glass structure opened in April 2004. This, after a construction period lasting 3 years, beginning in 2001. Interestingly, the building inhabits the former site of the Chamber of Shipping and the Baltic Exchange – buildings heavily damaged by IRA bombings in the early 1990s. Award-winning, Stockport-born architect Norman Foster, in partnership with London-based planning firm Arup Group, designed the building. Furthermore, “Neo-futuristism” is the architectural style employed here by Foster and his team. Referring to the modern, contemporary style the structure exudes. The Sage is a beautiful glass structure. Consequently, it one of the most famous buildings in the North of England. 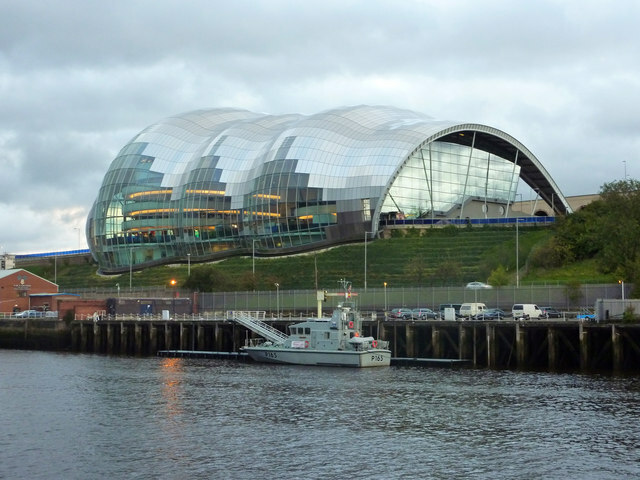 The Sage is used as a contemporary music and concert venue, and is situated on the south bank of the Tyne river. Furthermore, the Sage houses two large internal venues, named ‘Sage 1’ and ‘Sage 2’, with capacities of 1,640 and 600 respectively. Curved glass and steel are the main components of the Sage’s architecture. In addition to this, it is part of the same family as the, previously-mentioned, Gherkin. In that, the aforementioned Norman Foster and Arup group were the designers. The Sage is actually made up of three separate buildings, a giant curved glass/steel dome containing them. Thus, providing them all with insulation and sound-proofing from one another to stop another venue being contaminated by sound or vibrations. 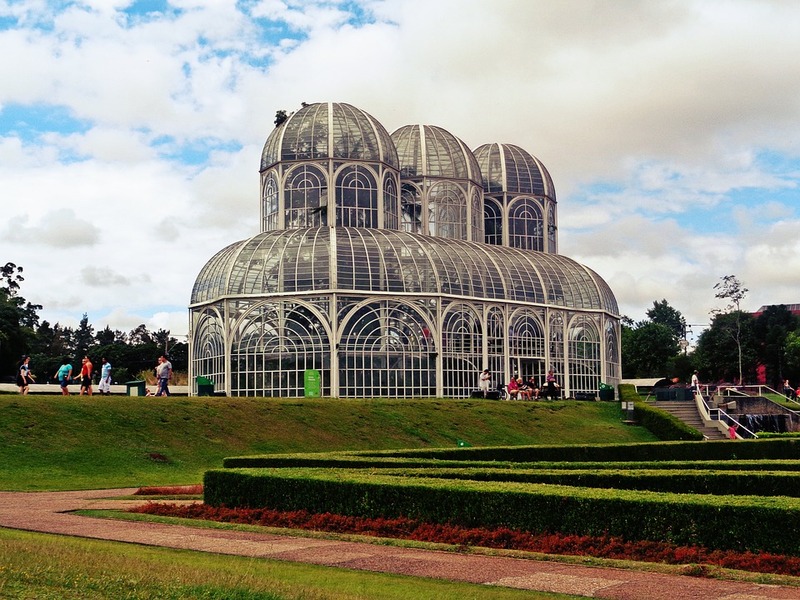 The ‘Jardim Botânico de Curitiba’, as it’s known locally, is located in Curitiba’s jaw-dropping botanical gardens’ beautiful greenery. Above all, the mesmeric glass structure is a hugely popular tourist attraction. Interestingly, the Brazilian public voted the botanical gardens of Curitiba number 1 in a 2007 poll to choose ‘the 7 wonders of Brazil’. The structure opened in 1991. As a result of Abraão Assad, the local urban building designer,’s inspired architectural ability. In the spirit of local culture, Assad was once quoted as saying that the flag of Curitiba inspired the shape of the building, along with the beautiful gardens. However, both British and French architectural styles are also thought to be used as inspiration for the assembly. As a result, The inhabitants of Southern Brazil consider the botanical gardens of Curitiba a proud symbol of their Country. The Shard is Located in Southwark, London, and is the United Kingdom’s tallest building. Furthermore, the Shard is also the 5th tallest building in the whole of Europe. Consequently, the 95-story skyscraper stands at a staggering 1,016 feet (309.7 metres). A 3-year construction period began in 2009. Culminating in mid-2012, with the grand opening of the impressive structure in early 2013. 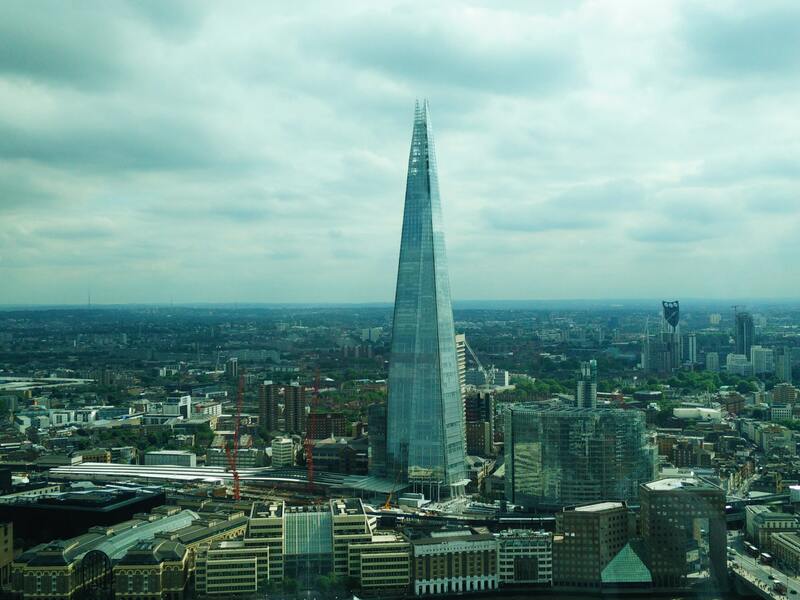 Impressively, The shard is home to over 32 different business organisations, as well as restaurants and a hotel. In addition to this, A viewing platform exists on the 72nd floor – a popular tourist attraction, aptly named ‘The View from The Shard’. Award-winning Italian architect Renzo Piano designed the Shard. Certainly, The story of how the Shard came to be is an interesting one. Most notably, Piano was said to have taken inspiration for the look of the building from: railway lines, Sailing ship masts, and the works of art of 18th century Venetian painter, Canaletto. Some quarters resisted the plans for the large glass structure. For the reason that, they felt that the building would look out of place, surrounded by the more aged architecture in that particular area of London. The Basque Health Department headquarters is a stunning piece of glass architecture. Deservedly, propping the building up to number 6 on this list. Located in the business centre of the Spanish city of Bilbao, the unusual, yet gaze-holding structure entered its planning phase in January 2003. Accordingly, construction of the building began in December of the following year. However, It took until February 2008 for the building to be constructed, opening its doors to the public later that year. The building itself is mildly controversial. For the reason that some local residents describe it as “out of place”. Meanwhile, the European Union nominated the building for the Prize for Contemporary Architecture. In addition, award-winning Spanish architects Juan Coll-Barreu and Daniel Gutiérrez Zarza desgined the Basque Health Department headquarters to be futuristic in style. 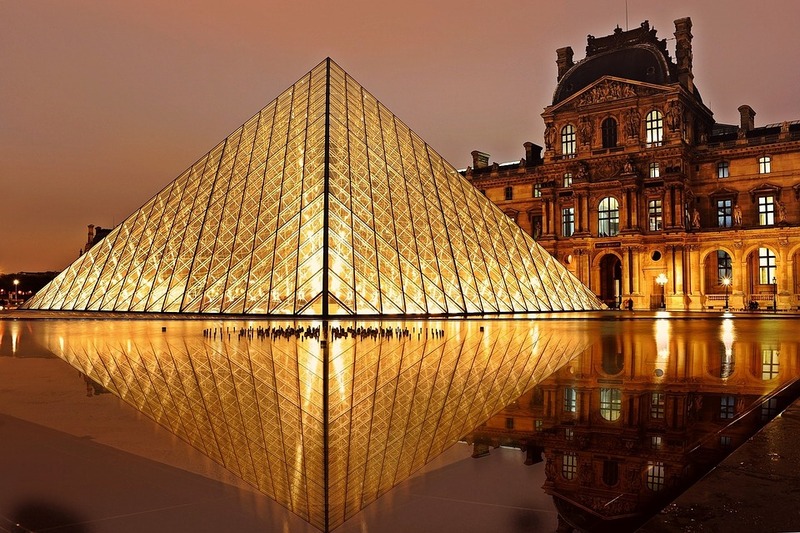 Opened in 1989, the Louvre Pyramid is a stunning four-sided triangular structure sitting in the courtyard of Paris’ famous Louvre art gallery. In somewhat of a contrast with its astonishing beauty, glass and steel are the buildings only components. Incidentally, the Louvre Pyramid is now one of France’s most popular tourist landmarks. Initially, French president, François Mitterrand commissioned the glass structure for construction in 1984. Furthermore, the building stands at a height of 71 feet (21.6 metres), and covers a surface of 11,000 square feet (1,000 square metres). Award-winning Chinese architect, Ieoh Ming Pei, designed the building. Interestingly, Pei designed the structure using only glass panes and metal rods. Thus, making it somewhat of a triumph of contemporary architecture. 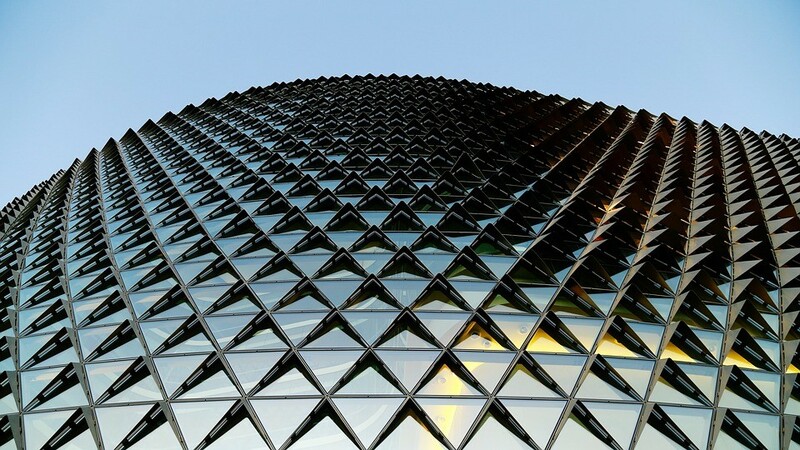 Regularly, controversy is seemingly a common theme with glass structures. For the most part, opening the Louvre Pyramid was a controversial act. However, the debate surrounding the Louvre Pyramid was much larger than with other glass buildings on this list – sometimes on a political level. To be specific, the structure attracted criticisms including: its modern style looked out of place, the Pyramid is a symbol of death in ancient Egypt, the project was merely born out of president Mitterrand’s pretentiousness, The designer, I. M. Pei was not French, thus, wasn’t in tune with the French culture. In spite of all this, as a piece of glass architecture, the Louvre Pyramid still inspires. 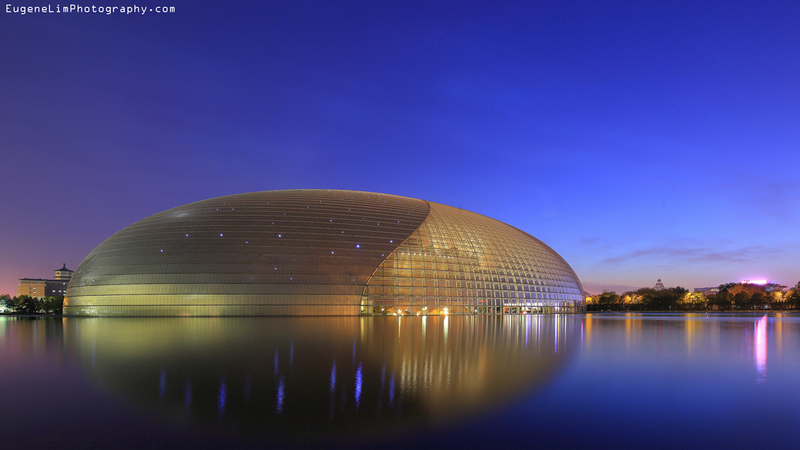 Sometimes described as ‘The Giant Egg’ by locals, the National Centre for the Performing Arts is one of Asia’s most impressive buildings. Fittingly, an arts centre is the primary function of the structure. 5,000 people can be accommodated in 3 separate halls to watch artforms such as Opera and Ballet. Interestingly, the building covers an area of almost 12,000 square meters, and a serene lake encompasses the ground it stands on. 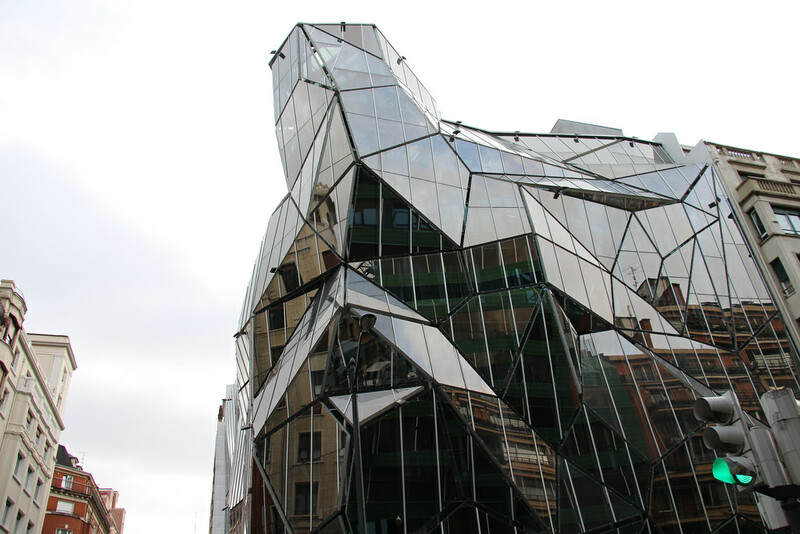 French architect, Paul Andreu, designed the incredible glass & steel creation. In addition to this, the size and complexity of the design meant that construction of the giant dome-like structure took nearly 6 years. Specifically, construction started in December 2001. Completing the structure took until July 2007, with December that year being the month the inaugural concert took place. 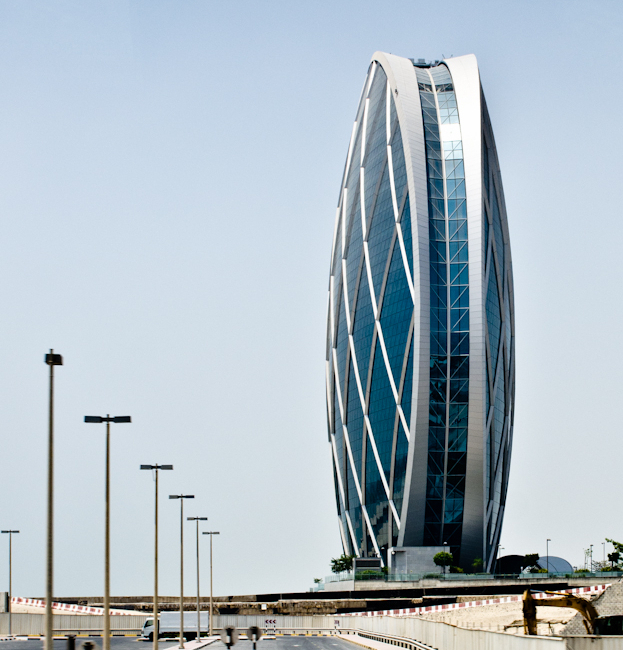 The Aldar Headquarters is the name of this awe-inspiring building. In short, the building is located near Al Raha beach in Abu Dhabi. To be more specific, the Aldar HQ forms part of large investments in the Al Raha area, which recently became a self-contained city. Perhaps unsurprisingly, the building has won multiple awards for its intelligent architecture and futuristic design. Thus, pushing the magnificent structure to number 3 on this list. Owners, Al Dar Properties, utilize the building as an office block. Subsequently, the structure is 121 metres tall with 23 floors of luxury office space. Therefore, it is perhaps unsurprising, that AED 1 billion (Dirhams, UAE currency) were spent to construct the building. Therefore meaning, that it cost around £200,000,000 in sterling. MZ Architects, in partnership with German company Josef Gartner GmbH, designed the building. In addition to this, the structure, is designed to look both imposing and extraordinary in equal measure. As a result, the building has a total built up area of 123,000 square meters. The Aldar HQ truly deserves its place among the world’s most beautiful glass buildings. This one-of-a-kind skyscraper is the Evolution Tower. 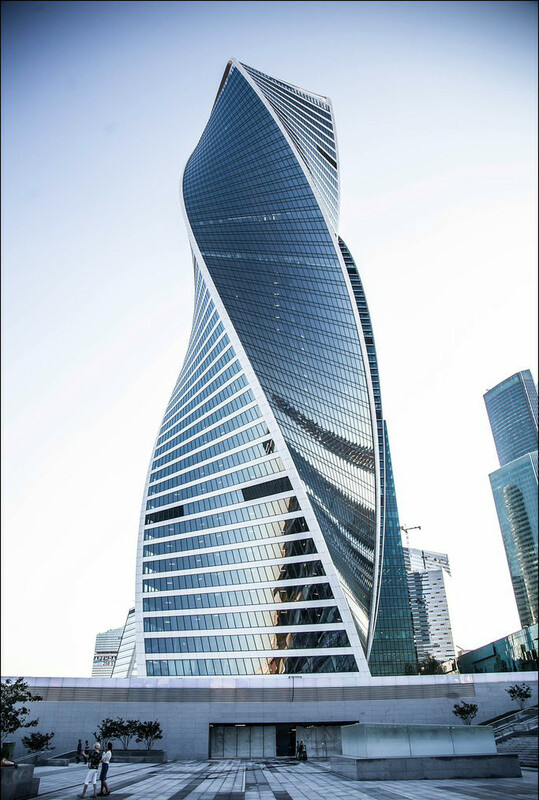 The 55-story office building is 837 feet (255 metres) high and is located in Moscow’s international business centre. However, It is a popular building among locals and tourists, who appreciate its futuristic, DNA-like appearance. Furthermore, the magnificent structure covers a total area of 169,000 square meters. Award-winning British architect Tony Kettle, in partnership with Russian architect Philipp Nikandrov, designed the Evolution tower. Interestingly, in 2016, oil and gas company Transneft bought the building for $1 billion US dollars. Construction of the structure began in 2011. Three years later Moscow city palace opened the building to the public (in October 2014) .To give more detail, ‘Structural expressionism’ and ‘Post-modernism’ are architectural terms used to describe the style of the building. In the opinion of this writer, there is no doubt that Moscow’s Evolution Tower merits its place on this list. 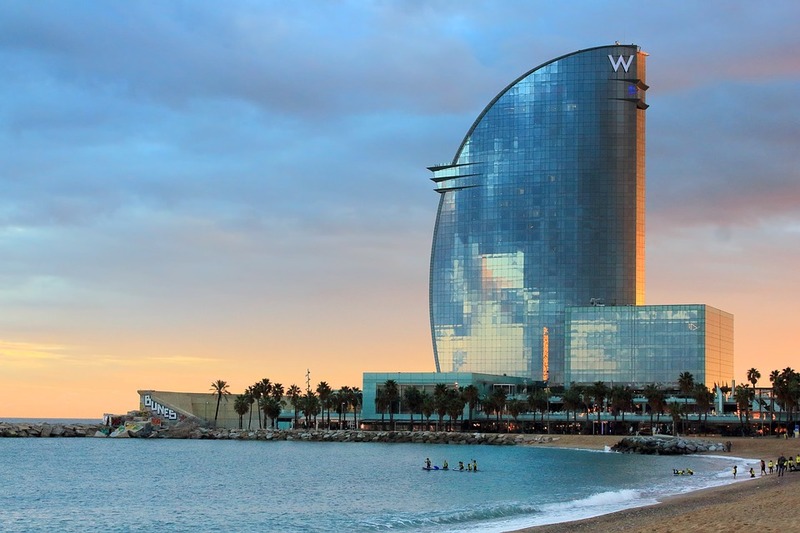 Sometimes referred to as the ‘Sail Hotel’ because of its resemblance to a ship’s sail, the W Hotel in Barcelona is this writer’s choice as the single most beautiful glass building in the world today. The stunning building is a fitting home to a 26-story, 5-star hotel containing 473 rooms and 57 suites. subsequently, the exquisite glass structure is 324 feet (98.8 metres) tall. Local award-winning architect Ricardo Bofill designed The W Barcelona Hotel, one of our times great architects. Perhaps fittingly, the hotel is located on the entrance of the Port of Barcelona, near the city’s famous boardwalk – a popular tourist destination. Barcelona is a city, famous for its beautiful architecture, and Bofill is on record as saying that he hopes the W Barcelona can become part of this story.